Hi, I found you via Sandra;s (Thistle Cove) blog. So very nice to meet you and these cool summer treats are very tempting. Your photography is beautiful. Have a nice weekend and enjoy all that great music. I love having music playing in the background as I work - Whilst you are enjoying the summer warmth, I am all rugged up "enjoying" some cold wintry weather, however I won't complain as the sun is shinning and the sky is blue! 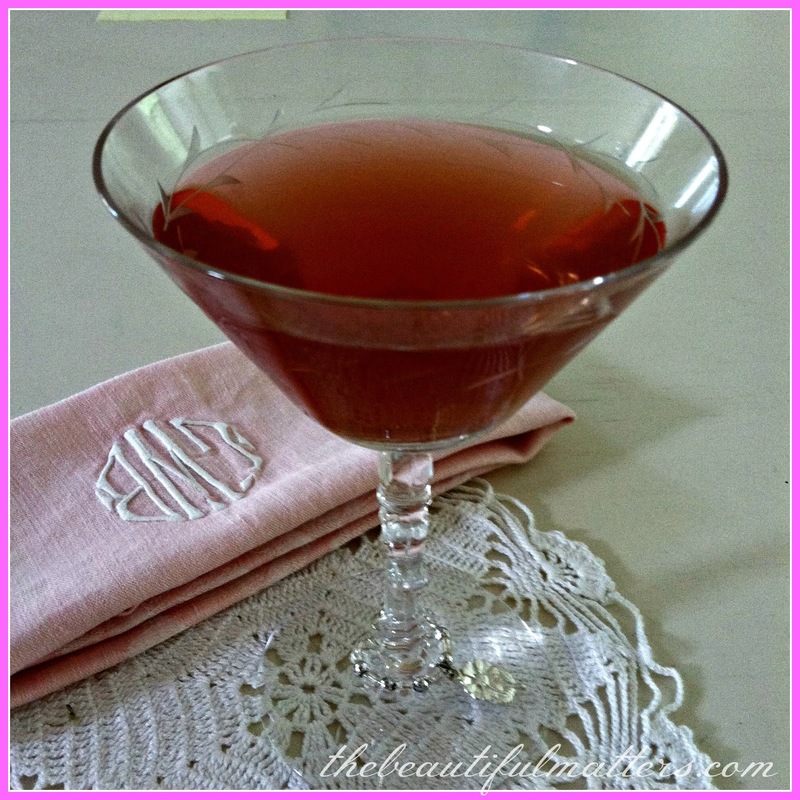 The martini sounds good; I often drink my Perrier water from a wine glass just to make it a little special. That indeed was very sweet of your daughter! Love your photo with the monogrammed napkin and the hand crocheted doily. Did you do them? Gorgeous plate!! 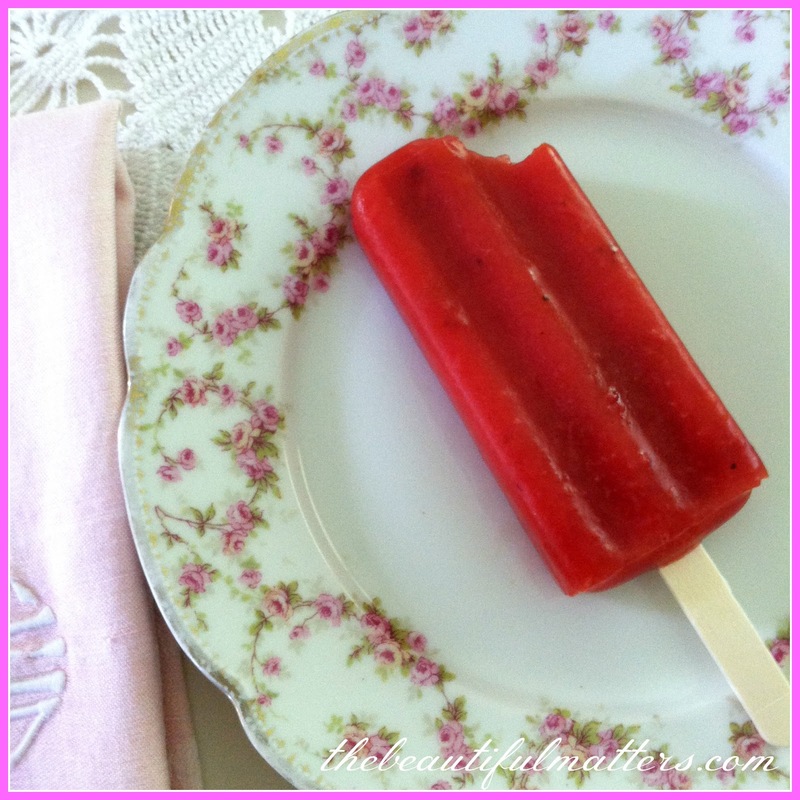 Strawberry pops sound heavenly. Especially here in the desert where I live. Happy Pink Saturday!! The drink looks yummy, Deborah. My girls have made some awesome CDs for me too, and I love it when they do. How very refreshing and I also love to use a lovely wine glass and such for my juice and water with lemon. And the popsicle looks yummy! Love the same era of music, as I listen to the Sirus station which I can listen all day long once in awhile! Taking pleasure in the simple things and enjoying it all! Sounds lovely - both the music and the beverage. I love the looks of your refreshing suggestions! I agree with you about the music. Hi Deborah, this sounds so refreshing and perfect for summer. The music mix is perfect to go with cleaning house!! Thank you for sharing and stopping by and your kind comment. Hello lovely Deborah, it was so good to see your name pop up in my email this morning. I miss your encouraging visits. I've deactivated my comments only temporarily.